Peasant and Nation offers a major new statement on the making of national politics. Comparing the popular political cultures and discourses of postcolonial Mexico and Peru, Florencia Mallon provides a groundbreaking analysis of their effect on the evolution of these nation states. As political history from a variety of subaltern perspectives, the book takes seriously the history of peasant thought and action and the complexity of community politics. It reveals the hierarchy and the heroism, the solidarity and the surveillance, the exploitation and the reciprocity, that coexist in popular political struggle. 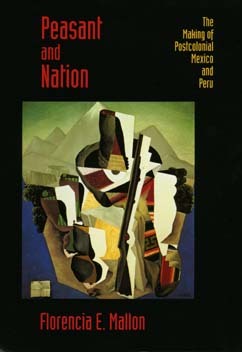 With this book Mallon not only forges a new path for Latin American history but challenges the very concept of nationalism. Placing it squarely within the struggles for power between colonized and colonizing peoples, she argues that nationalism must be seen not as an integrated ideology that puts the interest of the nation above all other loyalties, but as a project for collective identity over which many political groups and coalitions have struggled. Ambitious and bold, Peasant and Nation both draws on monumental archival research in two countries and enters into spirited dialogue with the literatures of post-colonial studies, gender studies, and peasant studies. Florencia E. Mallon is Professor of History at the University of Wisconsin. She is the author of The Defense of Community in Peru's Central Highlands: Peasant Struggle and Capitalist Transition, 1860-1940 (1983) and the coeditor of Confronting Historical Paradigms: Peasants, Labor and the Capitalist World-System in Africa and Latin America (1992).